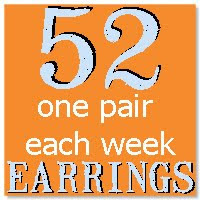 It's week eight of the 52 Pairs of Earrings a Year challenge and once again I'm scrambling to get something put together. I know, you all were probably expecting something totally fabulous like my Happy Returns last week, weren't you? 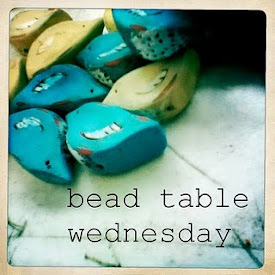 Well, this week I have bead soup simmering on the stove and it's not leaving me much time for anything else. So, for the second time (and I'm sure it won't be the last!) I dug deep into my polymer bead stash and found a few remnants: textured terracotta rondelles, bone rondelles and curved discs, and two seashells. To those I added frosted czech glass, ceramic rondelles, antique brass spacers and bead caps, and the cutest, little tiny brass turtles from Patina Queen on Etsy. 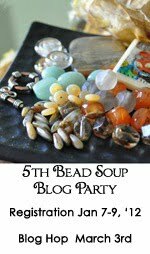 I'm dreaming of warm weather, the scent of sea salt, and sand in between my toes... and in the meantime I'm cooking bead soup! Check out the Flickr pool here to see what everyone else mixed up for week eight. I was so excited to see this month's challenge included birds. 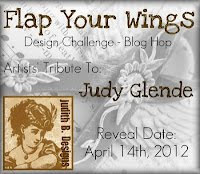 I had just recently discovered Birgitta's gorgeous wing pendants and knew right away they would be the perfect match. Birgitta graciously made a new set of pendants for me, glazed with the exact shade of blue in the painting. 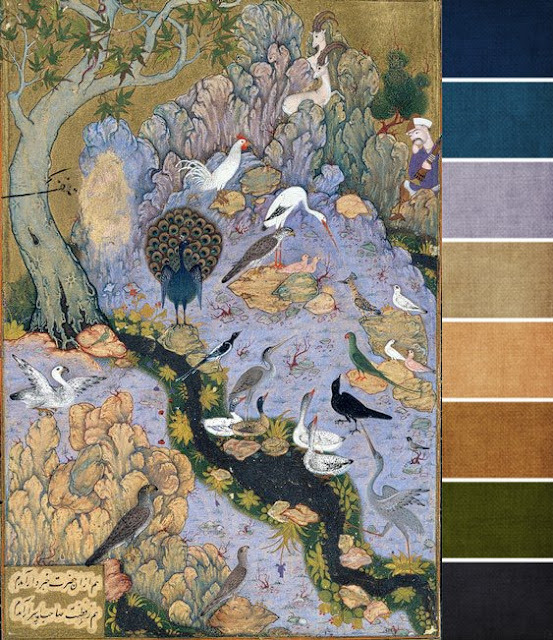 The Conference of the Birds by Habiballah, together with the color palette from Art Bead Scene. What I love about this painting is of course the birds (I go for just about anything with birds! ), but what really caught my attention was the style of the rocks (or are they bushes?) 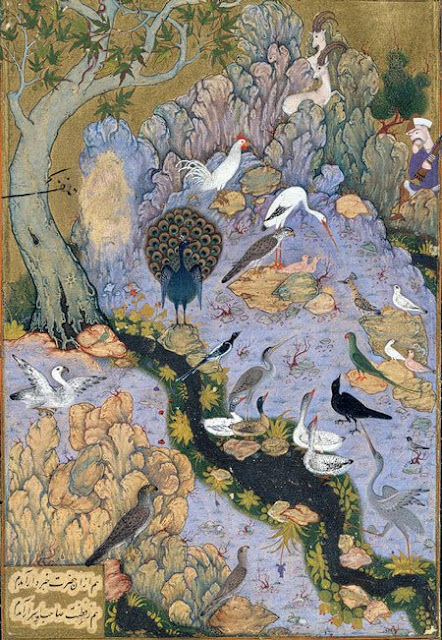 up towards the top and at the bottom left corner of the painting. They have an elegant, ruffled look to them—almost like feathers, I think. Birgitta's pendant mimics that style very well. So, I decided to try for a hint of that ruffled look in my design. And here it is! I call it Soaring in a Blue Sky. I started with a leather backing behind the pendant to help bring more colors into the design. I snipped the edge and then burned it slightly to darken it and to make it curl a little. Then using a wood burning tool, I drew a scrolling design in the center. I think of it like wind under the soaring wing. From there I added a few tiny blue agates with brass spacers and then moved onto more leather, again going for a ruffled look, but this time cutting little discs and piercing them and burning the edges. Between the leather I used brass and oxblood red seed beads for that hint of red in the painting. And next in the design, comes my second favorite part (my first being Birgitta's pendant!). These lovely links were my sister Bethanne's idea. She came in and looked over my shoulder as I was working and suggested I use fancy bead caps with the blue agate nuggets, but instead of putting them on the ends, she thought I should put them on the front. 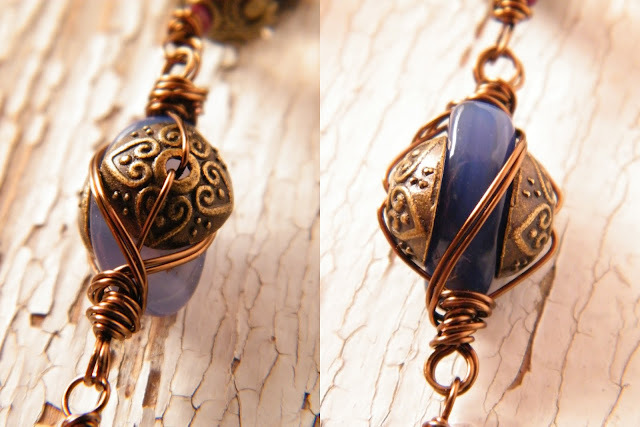 Well, I do love wire wrapping, so I tried it out and they were the perfect addition! And there you have it! My February challenge piece. Surprisingly there's not one bit of polymer clay in it at all! It fell together so nicely and there never seemed to be a place for polymer, so I didn't force it. I did make the leather beads and the clasp though, so at least I don't feel like I didn't make any of the components at all! It was a collaboration of sorts with Birgitta's pendant and Bethanne's link design, and it wouldn't have turned out nearly as nice without their help! Thank you both for being a part of making my necklace perfect! What fun! And what a surprise! I've been following Polymer Clay Daily ever since I started working with polymer clay years back. It's a great inspiration to see various polymer artists develop as Cynthia Tinapple posts something new each day. Some are new to polymer clay, and some have been at it for many, many years. I enjoy reading all their stories. And to find myself featured there today is such an honor! Thank you Cynthia—you really made my day! Remember last week's earrings? They were preceded by three other attempts. These new earrings were one of them. The polymer beads started out as a not-so-nice olive green. They weren't even baked when I gave up on them. It was almost dark out so I just hurried through my bead stash and more or less threw the Mystique earrings together and snapped a photo right at sunset. The sad, ugly green beads went into the oven later... I figured there couldn't be any harm in baking them. All week I kept thinking about them and wondering if I could actually revive them. Wednesday evening I decided to add a little paint... maybe that would help. I brushed on layer upon layer. Yellow, orange, green, blue, copper... They actually started to look better! Then I decided to paint little dots. Not sure where that idea came from! I'm not a polka-dot loving girl at all!! But it seemed to fit. I finished them off with two-tone czech crystals and some brass and glass beads. And to make them a little fancier, I sprinkled in some toho beads with the wire wrapping at the top. I think they're my favorite pair so far! And so I decided to call them Happy Returns... an ugly idea revisited turned into a happy pair of earrings! The fabric in the photo is my new top... somehow I got the colors to match perfectly!! Check out the Flickr pool here to see what everyone else mixed up for week seven. Thanks to a wonderful customer wanting to make bunny earrings, there are now mirrored bunnies in the shop too! Up next: painted roses (like the ones I used here) and more rainbow beads... and not just hearts this time! Another last minute pair of earrings for the challenge! These are the result of three ideas getting thrown out! 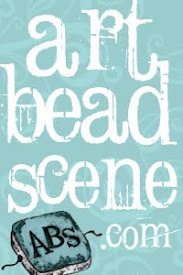 My first two ideas involved making new beads, but too many kinks developed along the way, and my third idea was just way too simple and boring. So, I stuck with these. They're made up of ridged rounds (I picked two purplish ones from my latest batch), pewter polymer discs textured with Queen Anne's Lace, and czech crystals. They went through a couple changes and originally had dangles hanging from the bottom hole. I finally went with a little wirework to fill in the hole and give them a more finished look -- I just don't like a hole with nothing hanging from it! What do you all think? Are they a good pair or a bad pair? Do they need more work? One thing's for sure: this challenge really keeps me challenged! I'm so accustomed to being able to think about an idea until it's perfect in my mind.... and THEN I begin creating. Today I took what I had and made what came to mind, without really too much thought. Check out the Flickr pool here to see what everyone else mixed up for week six. 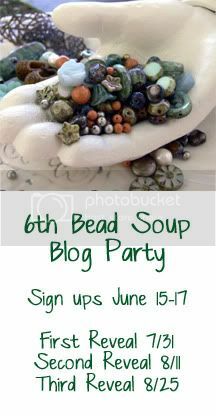 I really didn't know what to expect when I jumped into the Bead Soup Blog Party. 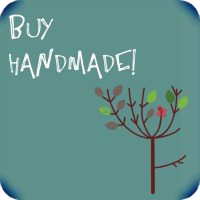 There are so many different jewelry artists all with different styles... there's no telling what you'll get. And that's where the challenge is, and the fun. Lori did such a wonderful job pairing up the partners! Just take a look at these beauties Pam sent... she couldn't have mixed up a more perfect soup for me! The focal I just love! Pam made it herself with PMC. There's also a pretty sterling clasp, Bali beads, labradorite nuggets, black agate rounds and rice beads, green jasper double drilled rectangles, red coral chips and beads, faceted smokey topaz, and little tiny Swarovski crystal bicones. 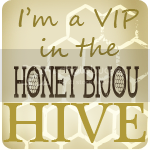 Come back on March 3rd for the blog party! 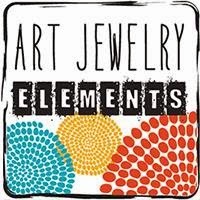 I sent her an assortment of some of my very favorites -- handmade polymer clay, glass, gemstones, and brass. I can't wait to see what she makes with it all! Come back tomorrow to see what Pam sent me! It's lovely!! Another last minute pair of earrings! I actually had these planned for last week, but then ran out of time. The loops are teal polymer clay. I textured them with a spiral stamp I made eons ago and filled in the detail with burnt umber acrylic paint. Then I sanded the edges of the loops and also the ends of the wood beads for a more worn and rustic look. The scattered spirals with tiny dots, combined with the wooden beads make me think of raindrops falling in a woodland pool. I really like how they turned out... they're big and they're boho... and they match my new handbag! I love brown and teal together! Check out the Flickr pool here to see what everyone else mixed up for week five. Already I have a plan for next week's pair. See you then! Today it's all about stamping and casting. I mixed up a new batch of teal clay and now I'm cranking out the Wild Roses and Aster Wheels. After filling, I pop the molds into the freezer for about 15 minutes to prevent distortion during un-molding. And ta-da! new teal roses!